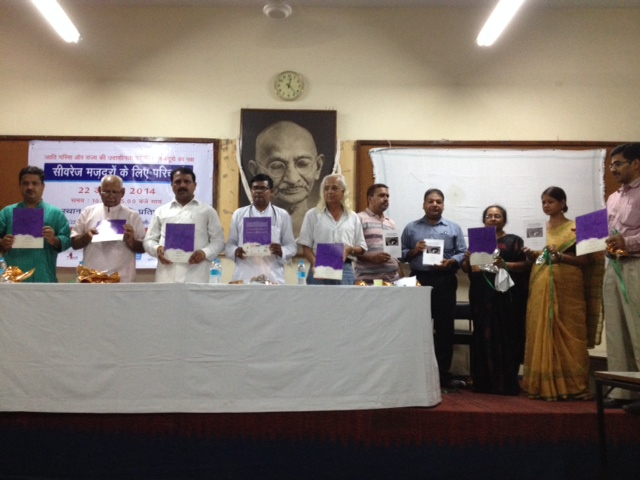 Dignitaries release the Voice for Change: Negotiating Case, Dignity and State Apathy book at the consultation held in Delhi on Friday. 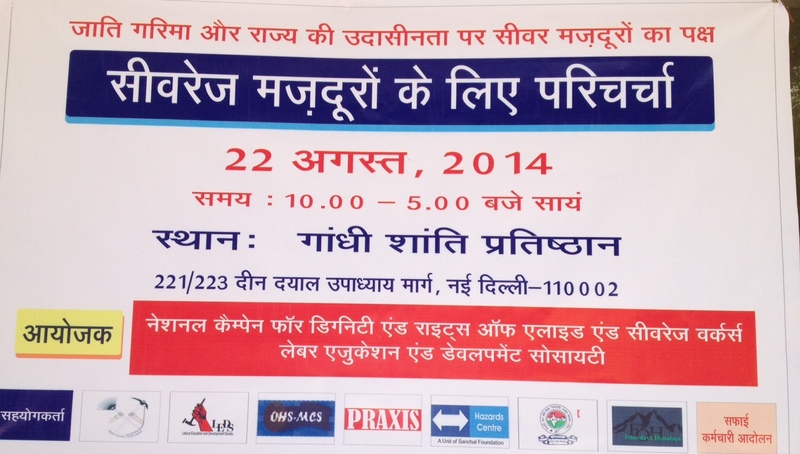 Safety and the importance of following government mandates emerged as the topmost priority at the national consultation on issues faced by sewerage workers organised at Gandhi Peace Foundation in New Delhi on Friday, August 22, 2014. The consultation, which was hosted by the National Campaign for Dignity and Rights of Sewerage and Allied Workers (NCDARSAW) and Occupational Health and Safety Management Consultancy Services (OHSMCS), began with the screening of Gutter Mein Zindagi, a participatory video made by the sewerage workers with support from Praxis Institute for Participatory Practices. The video showcases the daily risks and plight of sewerage workers, the contractual nature of employment and the resultant life of drudgery and uncertainty they get pushed into. The consultation also saw the release of two publications –‘Down The Drain’, a study on the occupational health hazards and the perils of contracting faced by sewerage workers; and ‘Voice for Change – Sewerage Workers Negotiating Caste, Dignity and State Apathy’, a narrative based on the experiences of sewerage workers in Delhi. The consultation saw sewerage workers share the hazards they faced in terms of lack of safety mechanisms, absence of an accountable authority they could turn to in case of emergency and the undignified way in which the work was carried out. “We don’t even have a place to wash after cleaning the drains,” said Chetan in the video shared at the consultation. “We don’t even know the name of the contractor,” another worker said. Referring to their plight, Mr Raju Sarthar from the Delhi Safai Karamachari Aayog (Delhi Safai Karmachari Commission) said it was imperative to stop outsourcing of sewerage work and bring in permanency in the contractual nature of the job. He also pointed out that initiatives had been taken to provide cashless medical facility and an order to the effect would be out soon. This comes as a beacon of hope to many contractual sewerage workers who are forced to shell out money on treatments for diseases contracted during duty. Mr Sarthar also said that the accidental death of any worker on duty would see a family member provided with their job along with a sizeable compensation, both of which were made mandatory by the government in 2013. Mr Ved Prakash, of the Delhi Jal Board Workers’ Union said the board should demolish sub-contracting in sewerage work. “It should initiate creation of safe and secure environment for sewer workers” he said. He also pointed out the need for awareness among the public about the plight of sub-contracted sewerage workers. Mr. Dunu Roy from Hazard Centre said “Delhi Jal Board should show transparency in sharing the amount spent on cleanliness.” He also added that impact on health was severe for both permanent and contractual based workers, hence the focus should be on health and health services. He also noted the importance of working on the structure of sewer lids, which would decrease the health effects and threat to the life of sewer workers. Dr. Ashish Mittal From OHSMCS pointed out that the workers lacked proper training about the technical aspects of working in a sewer. He said the workers needed to be trained in performing first aid in case of emergency.